The Department of Defense’s cyber community has found an unexpected proving ground to cut its teeth on operations: the Middle East. Lt. Gen. Stephen Fogarty, speaking to Fifth Domain Aug. 21 in an interview at TechNet Augusta, said cyber operators in the Middle East have worked “at a higher tempo than other commands" and in the process have developed “proficiencies." Cyber operations globally have ramped up in recent years. Fogarty, the head of Army Cyber Command, told reporters at a media roundtable in early August that the force has operated in the last 24 months at a level that far surpasses previous efforts, offensively and defensively. Central Command, the primary military combatant command that oversees operations in the Middle East and spans from Egypt to Pakistan, has seen the highest intensity of conflict in the last 15-plus years with both the Afghanistan and Iraq wars, and most recently operations to beat back the Islamic State group from its territorial gains in Iraq and Syria. Fogarty, most recently chief of staff at Cyber Command, now leads Joint Task Force-Ares, the cyber offensive effort against ISIS ground operations in that region. 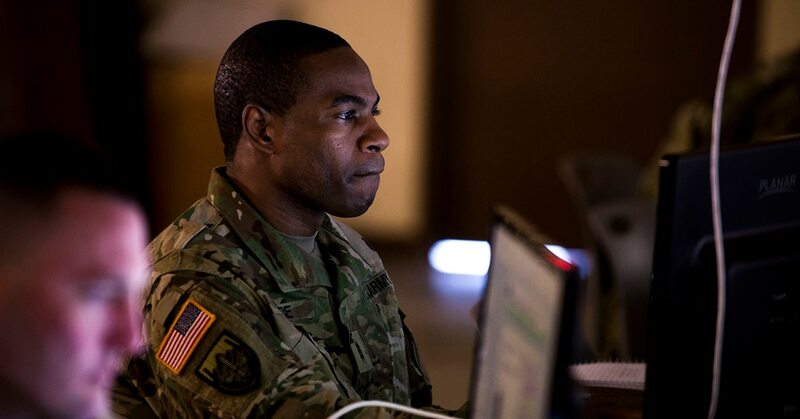 These fast-moving operations have provided an unprecedented learning laboratory for U.S. Cyber Command and Army Cyber Command through its Joint Force Headquarters-Cyber. The Joint Force Headquarters-Cyber provide cyber effects to combatant commands they’re assigned to. Joint Force Headquarters-Cyber Army is assigned to CENTCOM, Africa Command and Northern Command. While it is led by the head of Army Cyber Command, and made up of mostly Army cyber teams, it includes cyber teams from other services. One of the lessons learned from the cyber efforts to combat ISIS is that targeting the cyber domain is similar to targeting in the physical domains. Will ISIS make up for lost territory virtually? One Army leader looks at a way ISIS could "resurge." Fogarty explained how the joint nature of cyberspace, and the employment of joint forces, allows teams to go back to their respective service components smarter. Fogarty told Fifth Domain that Air Force and Navy teams under his command also develop repetitions in the Middle East, making them faster and more proficient. Fogarty said one of the successes of Joint Task Force-Ares has been bringing together the service cyber components. In addition, Fogarty said that with the work in the Middle East the other combatant commands are beginning to develop experience as well. Fogarty also said the military “cyber commands” could be renamed to something like Information Warfare Operations Command to encompass the entirety of the domain, which is larger than just “cyber.” Such a move would represent a larger integration of information-related capabilities. By limiting itself to just cyber, what happens is the force can only see and influence part of the larger battlespace, Fogarty said. “What we’ve watched our adversaries do is very skillfully synchronize information operations, military deception, psychological operations, electronic warfare — all intelligence disciplines,” he said. Where do information operations fit in the DoD cyber enterprise? With the evolution of cyber and the information space, could the Department of Defense organize under a unified information command synchronizing capabilities? Fogarty and other DoD leaders have said Central Command is where the community is seeing the integration of information operations, electronic warfare and cyber. “Where we begin to see this merger of cyber and intelligence to help us with our information operations, messaging and counter messaging,” Lt. Gen. Darsie Rogers, deputy director for combat support at Defense Threat Reduction Agency, said Sept. 5 at the Intelligence and National Security Summit hosted by INSA and AFCEA, speaking about his recent assignment at CENTCOM. Rogers said he believes cyber and intelligence meshed together are the background to be able to effectively counter malign efforts around the globe, publicly shame folks for the things they’re doing and make sure the world understands what’s happening out there — not just with peer competitors, but also rogue states.